In 2010 the European Commission was about to present the Bruges Communique, formulating the future of VET in Europe. 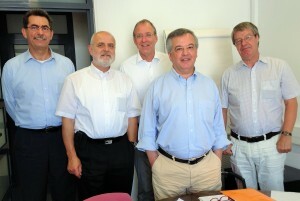 The four associations decided to join forces to influence the policy content. The success of their collaboration led to a structural meeting with the European Commission. In that context two additional associations for Academic and Professional Higher Education were asked to join the discussions (eucen, EURASHE). In 2014 all six associations agreed to work together under one umbrella. The organisations have kept their respective responsibilities and activities, but are seeking for reaching joint objectives as far as possible in assuring quality in VET and parity of esteem of VET in society. Also progression from (H)VET to Higher Education is an important issue. All this in the interest of VET students, companies and the social and economic development in Europe. The acronym VET4EU2 refers to the 4 networks that are mainly working in secondary VET plus the 2 networks that work primarily in Higher Education. VET4EU2 reads as “VET for you too”, thus suggesting that VET is a respectable educational route for all. It also refers to the route from VET to Higher Education, which should be considered as an equal option compared to the route through General (secondary) Education. Using this acronym is also an indication of the strong will to work together on the above issues.